The Mega's heaviest thread/profile forming machine at the moment which equipped with swivelable roller shafts. This ensures optimum capacity and use in making threads and axially parallel profiles in the through-feed process. However, short cylindrical parts (especially thread pins) can also be rolled in the through-feed process. For this special through-feed process automatic feed of the work is necessary. This machine can also be used in the in-feed process. 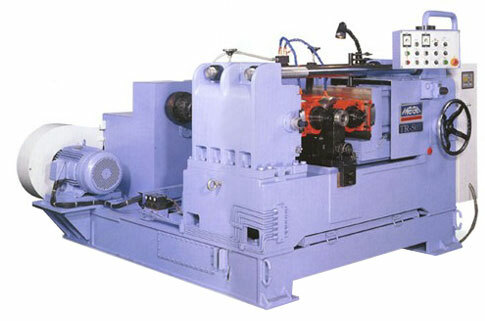 For this special there is no axial movement of the workpiece. Swivelable roller shafts at full utilization of the rolling force. Short working cycles by increasing the forward-return speed. Increase in the efficiency and improvement of the utilization of power by gears on parallel axes and drive by universal shafts.